I love bananas! I was gonna say something like, ‘I’m banana for bananas,’ but decided it was too corny for even me–alas, I spared you, sort of. But I do love bananas, so please do not let my blatant neglect lead you to believe otherwise. Last week, I bought a bunch of bananas with the intention of eating one each day. Out of 6, I had 4 left. Instead of letting them go bad, I decided to bake. Because really, what’s easier and more delicious than just about any banana recipe? 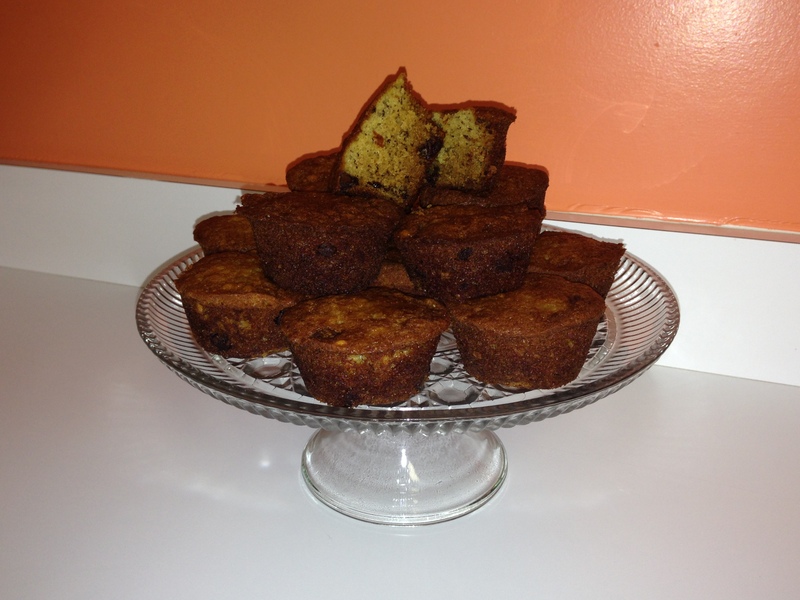 So, in my quest not to be wasteful I came upon this recipe for chocolate chip banana muffins. They are divine, enjoy! In large bowl, combine butter (you can use softened or melted – the muffins turn out great with either), sugar, mashed bananas, eggs and vanilla until well blended. You can do this by hand or with a mixer. Bake for 12-17 minutes until dark golden brown – stick a toothpick in the middle and it should remain clean. If your oven has a hot spot, you may want to rotate pans halfway through. Remove from oven and let cool in tins for 1-2 minutes on cooling rack. Take a spoon or knife and carefully lift muffins up and set them on their sides until completely cooled. This is so the bottoms don’t steam and stick to the pan. – My butter was semi-melted/softened in a microwave-safe dish. – Using a potato masher to mush the bananas was super easy and made for quick clean up. – To mix the wet ingredients I used a Kitchen Aid standing mixer and when I poured the dry into the wet, it was set on either ‘stir or 2’ because I wanted to be mindful not to break up the chips. – This was the first time I used a spoon to get muffins out of the pan and it worked perfectly. This was also the first time I set muffins on their side to cool–worked like a dream. Such simple but incredibly useful tips for the future! *This recipe can also be made into a 9×13 cake, varying muffin sizes, or 2 loaves – just alter the baking time as needed.